Reordering your views in the Outline should be much easier now. First, the drag & drop support in the Outline has been completely rewritten. It now shows feedback lines while you drag to allow you to target specific positions between (and before and after) tree elements. 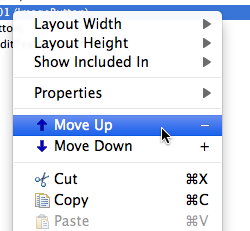 Second, there are new "Move Up" and "Move Down" actions in the context menu. These also have the keyboard shortcuts + and -. Therefore, to reorder items, just click on the item you want to move and press + and - repeatedly to move the item to where you want it.